Sorry for what I am about to say.. But.. Is that just MS paint you made that diagram with? Me? Are you serious? I could never have drawn that in paint. But if what you are saying is the case, then why don't all pistons move back? And there would be less force acting on the back of the bolt than the front because the air would only act on the o-ring at the front, while at the back, air can act on o-ring and the back of the bolt. 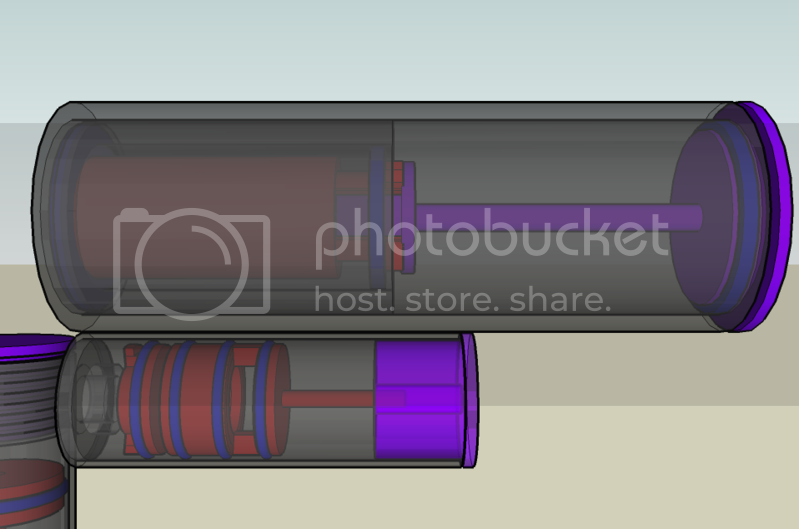 I forgot to make the bolt stop smaller than the bolt, so in my diagram, there would be more pressure acting on the front. Here's the bb gun that I was talking about. if you had a 2 input air cylinder and added equal presure to both sided it would extend because of the unequal suface area. I was talking about the first post, That is google sketchup.. Sorry, disregard my previous post. I completely contradict myself within the first and second paragraphs. Here's a better view of the bolt's surface area. I am pretty sure that the force of liquids and solids increases as you decrease surface area. 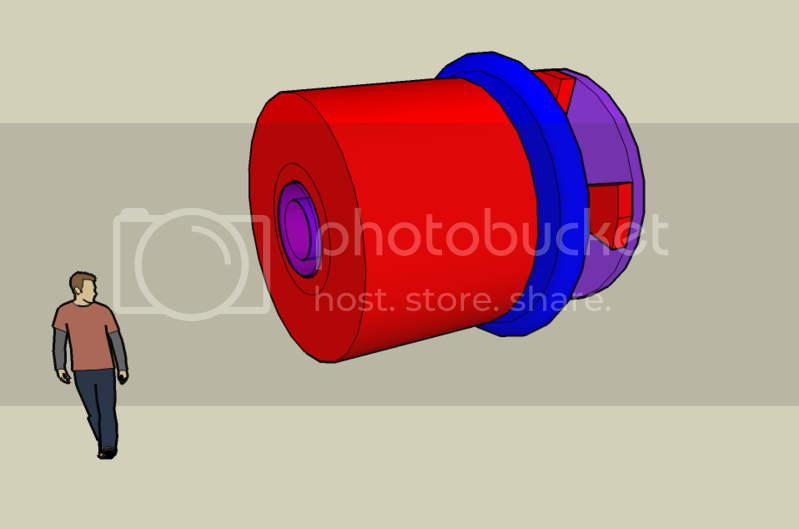 That's why barrel sealing piston have such little surface area on its sealing side; to maximize the surface area difference and thusly the force produced. As you can see, the bolt does have less surface area on the back (air chamber) side. If I were to be filling both the pilot side and the air chamber side simulatneously, I might possibly encounter the problem that you stated. 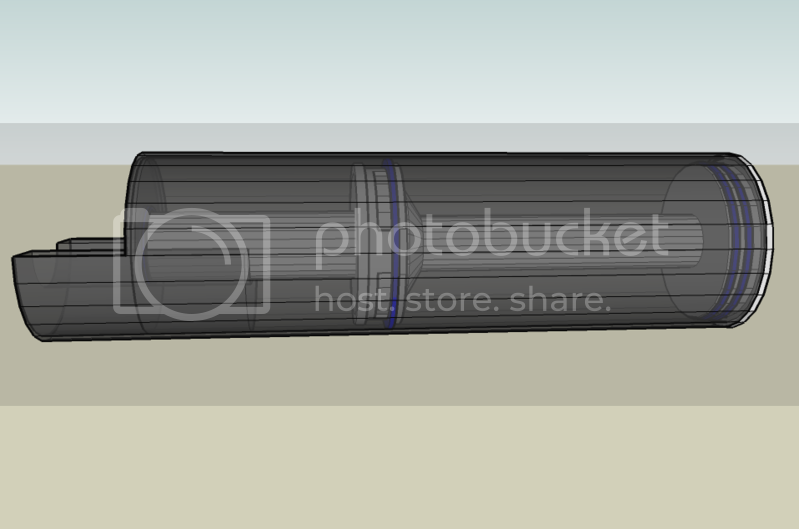 But I am only filling the pressure chamber from the pilot side (see al-xg's most recent dedsign). 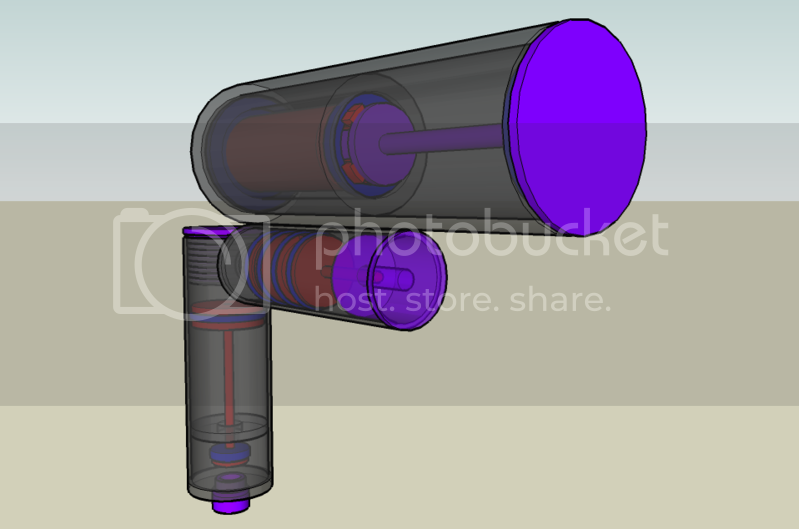 That means the bolt would be filled with air, the bolt would back and air would pressurize on both sides,. The bolt functions exactly like any other piston. And yes I drew my original designs with MS paint. I am pretty sure that the force of liquids and solids increases as you decrease surface area. 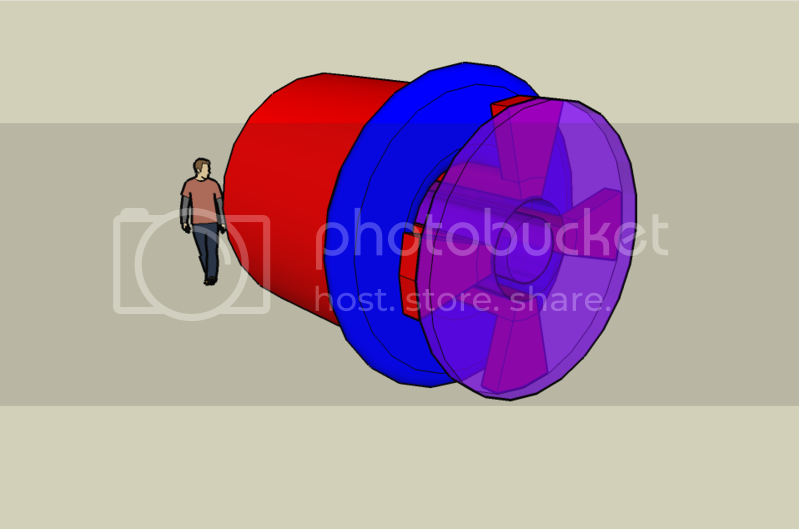 Pumps are able to create more pressure because they have less surface area. You said it yourself, psi stands for pounds per square inch; or in other words, force divided by surface area in square inches. The formula for calculating pascals is newtons divided by meters squared. Therefore the larger the surface are (square inches or meters squared) the smaller the force, if pressure remains constant. 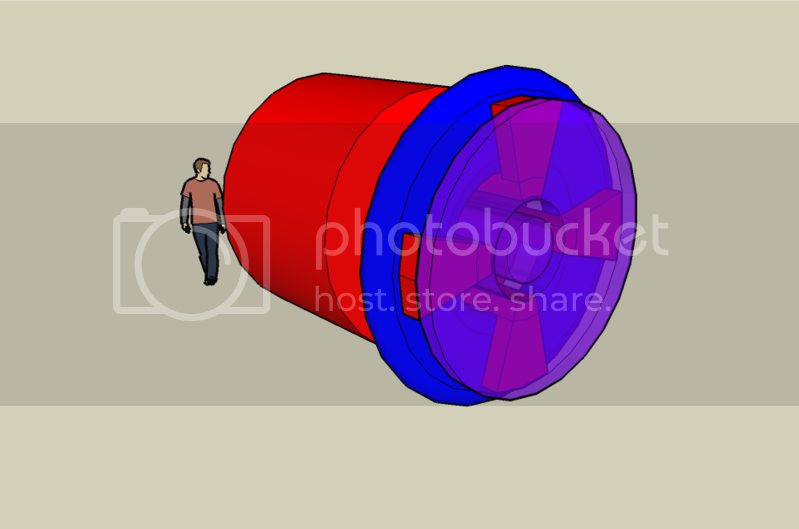 Lets calculate the force acting on different sides of a piston. On the pilot side there is 2 square inches. On the sealing side there is 1 square inch. If the force acting on both sides is 10 pounds, then the pilot side would have a pressure of a 5 psi and the sealing side would have 10 psi. As for the pistons, just watch the shock wave animations in the Types of Pistons sticky. 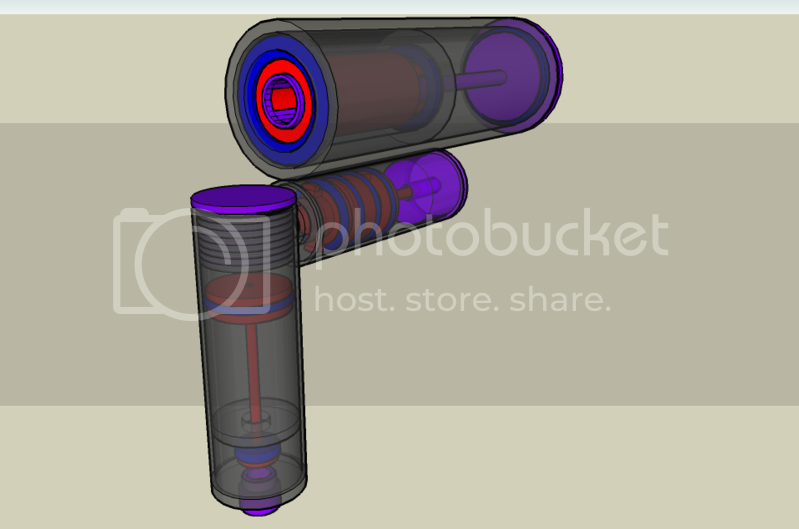 In the upper right hand corner, you can see the pressure difference in th opposing sides of the piston. first you add air pressure so lets say you pump it to 10psi, on the sealing side (1 in^2) will have 10 pounds of force, and on the pilot side (1 in^2) you will have 20 pound of force, because you have 10 pounds of force for every square inch. Just for clarification, you mean 2 square inches right? WOW! I feel like an idiot! 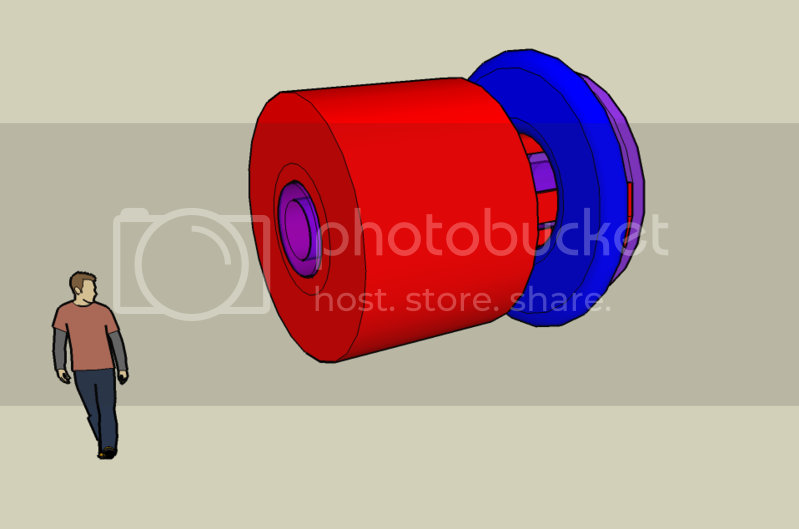 I always thought that pistons worked because the sealing side had more force than the piston side when the chamber was filled. If I had only looked at the formula of pressure (the one that I quoted like 50 billion times in my last post) I would have realized that force increases with surface area. iknowmy3tables, you called it earlier. I completely misunderstood how hydraulics work and it transfered over to my view of piston physics. I don't think there are enough "oops" smilies to show how stupid I feel. So barrel sealing pistons work because the pilot force has to drop significantly before the piston can move back. When it finally does, air is exposed to to the whole sealing face and it causes an extreme change in forces resulting in the fast opening time associated with barrel sealing pistons. I need to redesign the bolt now, but here is what I made before I realized how much of a tard I am. Its only the bolt, valve, QEV, and regulator. No the pressure is even inside the chamber, the reason it works is that the air is trying to escape but is getting blocked by the piston, it becomes uneven when piloted, hence the piston moves backwards. Novacastrian wrote: No the pressure is even inside the chamber, the reason it works is that the air is trying to escape but is getting blocked by the piston, it becomes uneven when piloted, hence the piston moves backwards. Oh yeah, we know that. He was just trying to explain to me the force differences involved with pistons, not the air flow. Here's a close up of the bolt and 3 way valve. I realized that the floating o-ring does much more than act as a check valve. When the firing chamber is filling, the o-ring slides back. This exposes the o-ring's entire left side. On the firing chamber side, there bolt rod exposes a little more than half of the o-ring. It's a marginal difference, but it still does result in a force difference, something that most high end electro-pneumatic markers lack. 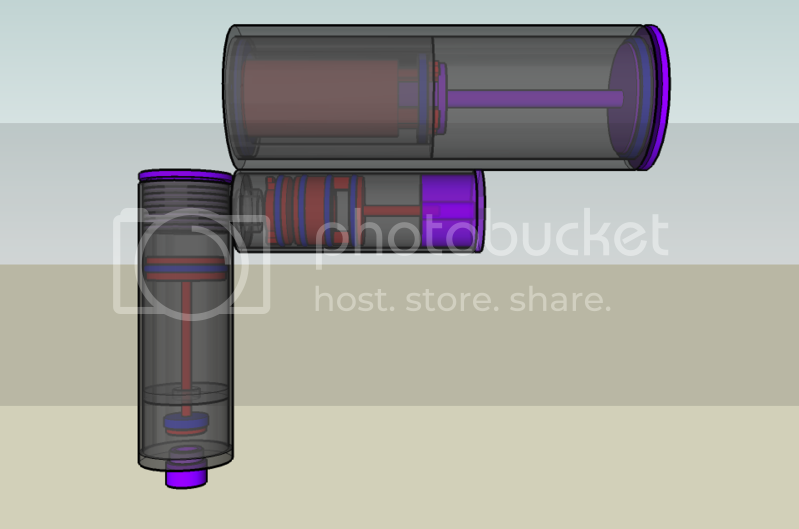 The 3 way valve is designed so it can be activated by a solenoid. This solves the problem I had with finding a way to pull the trigger from that position. It also means that the valve will open much faster and thusly a higher ROF. Wait, is there still a surface area problem with the o-ring? I mean when its filling, the entire left side is exposed compared to the right side where only half of the o-ring and a little bit more is exposed because the bolt rod is covering the rest. So it should stay back when it is being filled right? And when the pilot is activated, the o-ring moves back and now the entire right side is exposed and the wall of the bolt's walls. And would that give it more surface area? I'll post a quick diagram later if I'm not explaining myself clearly. EDIT: Damn it! I forgot to delete the SketchUp character. Now all my pictures have some weird guy in the background.